Spend the morning meandering through the formations of the UNESCO listed Stone Forest, where towering limestone pillars stand treelike in a fascinating illusion of woodland. Return to Kunming and in the evening, sample the local delicacy, Across the Bridge Noodles. Tonight, there is also the option to see a colourful showcase of Yunnan’s performing arts. Travel to Dali, a charming town that offers a peek at the China of times-gone-by. Begin your tour by exploring the fascinating old quarter and lively market to soak up the local atmosphere. Next, visit the age-old Three Pagodas and later this evening, take a stroll down Foreigners’ Street. Spend the morning cruising the mirrorlike waters of Erhai Lake and admire the spectacular scenery provided by the Cang Mountains. The rest of the afternoon is at leisure to further explore the area. This morning, explore Xizhou Village and browse its lively local market. Drive to Lijiang, set in the foothills of the Jade Dragon Snow Mountain. 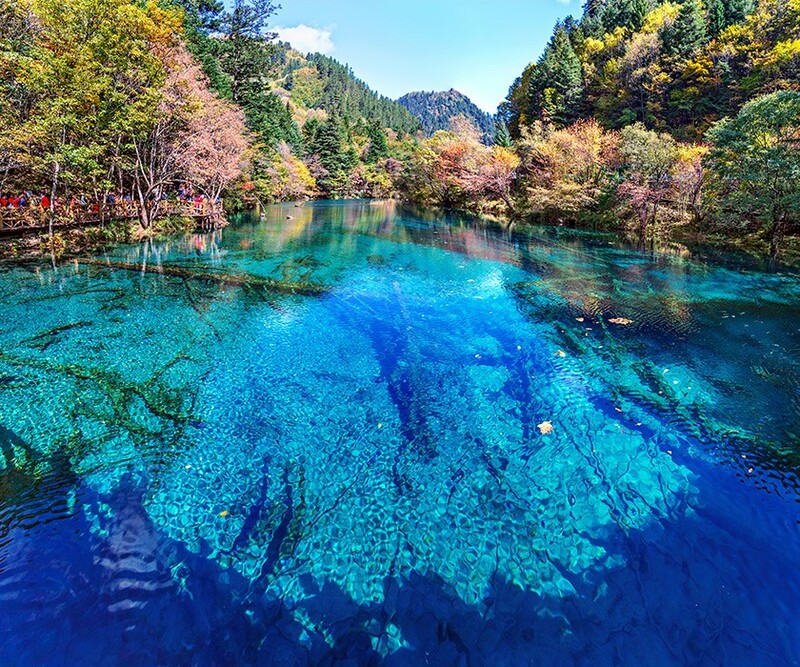 Visit the Black Dragon Pool, where there are wonderful views of the mountains, before mingling with traditionally dressed Naxi women in the bustling markets. A magnificent mountain, the Jade Dragon Snow Mountain comprises several peaks, the tallest of which soars 5,500 metres. Taking a cable car, explore one of the beautiful high meadows and enjoy the amazing vistas. On the way back to Lijiang, visit Baisha Old Town to view the fascinating frescoes painted during the Mong Dynasty followed by a visit to the Embroidery School. Journey to the 3,000 metre deep Tiger Leaping Gorge. With its backdrop of snowcapped mountains, it is one of China’s most extraordinary sights with spectacular and breathtaking views. Return to Lijiang and explore the old quarter; the quintessential Chinese ‘old town’ and wander the jumble of cobbled streets, traditional wooden buildings and rustic stone bridges. Fly to Chongqing and transfer to Wulong  an area of stunning natural scenery with towering limestone karsts, deep gorges, caves and natural bridges. Its remote location has ensured that the park is relatively un-spoilt. It comes as no surprise that Wulong is a UNESCO World Heritage site! Today, visit Three Bridges National Park, a rare geological wonder consisting of three natural karst bridges: Tianlong Bridge, Qinglong Bridge and Heilong Bridge. Continue to Longshuixia Fissure, a narrow fault line that has been carved out by the river. Drive to Leshan and enjoy the rest of the day at leisure. Take a day trip to see the 71-metre high UNESCO listed Grand Buddha. Completed in the year 803, it is said that the Buddha’s presence has calmed the turbulent waters of the river. View the Buddha from above before taking a short boat trip, which will give you an even better perspective from below. Continue to Emeishan. Mount Emei is the cradle of the Buddhist religion in China with the first temple built on its peak in the 1st Century. Admire the striking and diverse natural beauty of the mountain and spend the day soaking up the ambience and exploring. Travel to Chengdu and take a walk through the famous snack street  Jinli! Tonight, there is an option to see a performance of the Sichuan Opera, famous for ‘face changing. Visit Chengdu’s famous Panda Conservation Centre to see and learn about China’s celebrated icons. See them up close in surroundings that mirror their natural habitat as they chomp through piles of bamboo. Later, stroll through People’s Park, visit a traditional teahouse and see Matchmaker’s Corner where parents search for worthy suitors for their children. This evening, dine on mouth-watering Sichuanese cuisine.